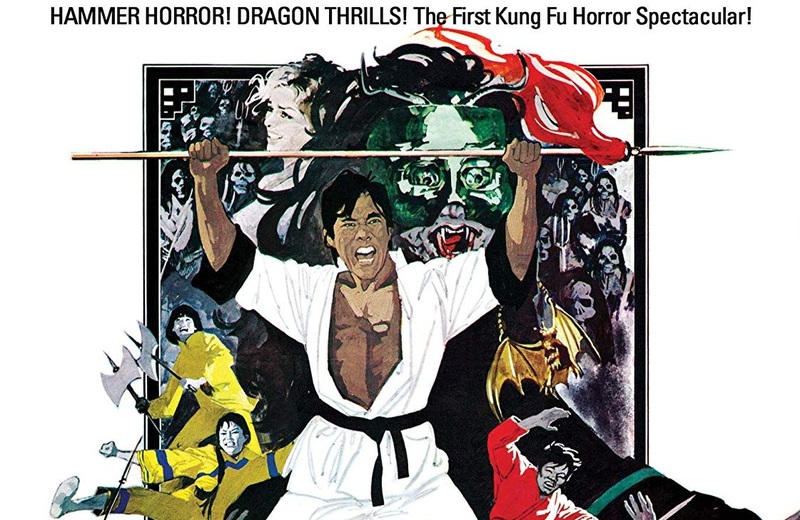 Adam wants more out of the Hammer/Shaw Brothers mashup; The Legend of the 7 Golden Vampires. Scream Factory has done an amazing job with the Extra and Transfer. What happens when you have Shaw Bros. Studio team up with Hammer Productions? The Legend of the 7 Golden Vampires, that’s what you get. Part Seven Samurai riff part Van Helsing vs. Dracula tale, all stupid insane fun. There isn’t much to this mash-up tale of Vampires and Martial Arts. When I say that it isn’t that The Legend of the 7 Golden Vampires is not entertaining, far from it, but there isn’t any narrative heft to the proceedings. The story of seven brothers led by Hsi Ching (David Chiang) and one sister Shih Szu (Mai Kwei) hiring Van Helsing (the always amazing Peter Cushing) and his dilettante son Leyland (Robin Stewart) to fight the recently risen Vampires, led by Dracula (John Forbes-Robertson doing his best Christopher Lee) in their village. This troupe of a story was already well worn by the time of its release. To add to the issue the concept is the only narratively inventive or meaningful item in the entire film. Nothing about the Vampires, Dracula, the Brothers is smartly written. Even Van Helsing is lazily written as a man who at first doesn’t believe them, then goes on this adventure for… what reasons? We are not entirely sure. Even Dracula’s motivations are spotty at best because a Monk from the Chinese Branch of the Vampire Union says they need his help to … replenish the blood supply for these Seven Golden Vampires? It’s these simple narrative inconsistencies not only in the script but the performances; Cushing doesn’t help matters by looking both confused and bored at the same time. What the film lacks in narrative inventiveness makeup in actual lunacy. The way the film approaches the simplest task seems out of left field. There is no real reason certain things happen other than to have them happen. The romance between Shih Szu and Leyland happens because it’s dictated not because the characters have a reason to be attracted to one another. To see these two, the son of Van Helsing and the sister of the seven brothers, attempt the terribly written romance is both insulting and hilarious. Or the biggest misstep, making the brothers so adamant that Van Helsing is the only one that can help them because they are helpless. This is almost a comedic setup and payoff, as once hired and for the rest of the film, Van Helsing sits idly by as the brothers have full-on battles with various road Bandits, Vampires, and Zombies. Essentially the brothers solving their own problems without the help of Van Helsing in any way. He literally does nothing for them they don’t do themselves. The way these moments are shot are even funnier with Cushing looking lost at sea. Scream Factory has gotten a beautiful new 2K transfer from the original film elements that looks gorgeous. Please temper expectations. This is not a wet gate restoration. I mention this because the picture does contain the wear and tear of time with minor pops and scratches that is the norm without a full-on restoration. The picture is still lightyears ahead of original incarnations from the UK and DVD, with great color reproduction and beautiful grain structure. Anyone that loves what Scream has done in the past with their Hammer titles will be happy with this release. Included is an alternate US Theatrical Cut. Note this version only increases the issues with the film. It is great that it’s included in the highest possible resolution (basically HD with about from my estimates about two to three minutes of SD inserts). The inserts make the changes easier to spot. The commentary by Hallenbeck is great at giving context of how these two superpowers of the ‘60s and ‘70s came to produce this odd-duck of a film. When Hammer Me Shaw – is a 7-Minute interview with actor Chaing where he briefly talks about his involvement with the film. The interview is in Mandarin with Subtitles. Kung Fear – Rick Baker on The Legend of the 7 Golden Vampires is a 20-minute interview with the AUTHOR/CRITIC (not the Makeup FX guru) his personal recollections and additionally a dissection of the production, release, and film itself. Baker is obviously excited by the film and its a unique mashup. He also discusses the Shaw Brothers and David Cheng. It’s a great interview giving context for the film and its history. Rounding out the extras are the Theatrical Trailers, TV Spots and Still Gallery. Those that love The Legend of the 7 Golden Vampires will be happy with this edition. Those new to the film will find more lacking with the film itself than the extras or transfer provided by Scream Factory. Scream Factory’s Blu-Ray Edition of The Legend of the 7 Golden Vampires is out April 9th!